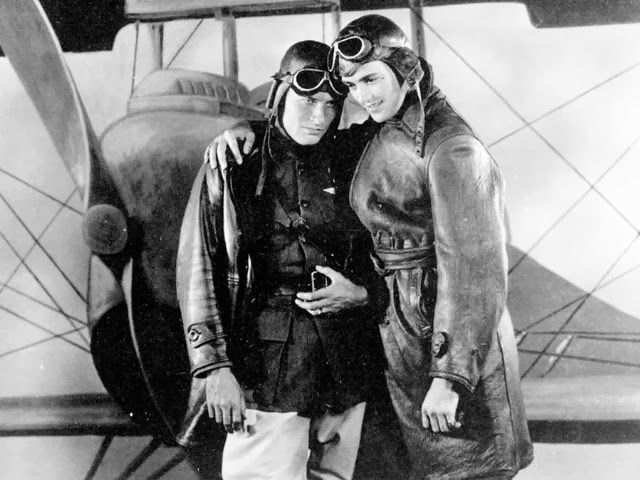 The film that won the first Academy Award for Outstanding Picture was an ambitious drama about two American aviators who become bosom pals during World War I. These two men (Charles ‘Buddy’ Rogers and Richard Arlen) form a strong friendship – even though they both love the same woman. Wings was a big-budget, high-tech spectacle, costing $2 million US (in 1927 dollars!). It was the second-highest grossing film of the year, after The Jazz Singer. You might be wondering what $2 million could get you in a black & white silent movie in 1927. Paramount, the studio backing the film, may have wondered the same thing. Because Wings is about aviators and aerial battles, there is no shortage of fascinating footage shot in the air. Indeed, many battle scenes look like sky dances. planes colliding mid air and falling to earth. a pilot struggling to free himself from an upside-down plane. planes taxiing and taking off from a runway, as filmed from above. planes dropping bombs and destroying buildings – filmed through bomb bay doors. This kind of footage is humdrum today, but director William A. Wellman was giving audiences a wildly innovative film in 1927. In fact, you’ll swear the actors themselves are flying the planes. As thrilling as the aerial scenes are, and as condemning of war as it is, there are two overriding themes in Wings. In our opinion, Wings not only deserved to be named Outstanding Picture, it deserves the honour of being the first recipient of that award. It set a high standard for Best Picture nominations in all the years to follow. Wings: starring Clara Bow, Charles (Buddy) Rogers, Richard Arlen. Directed by William A. Wellman. Screenplay by Hope Loring and Louis D. Lighton. Paramount Famous Lasky Corp., 1927, B&W, 144 mins. 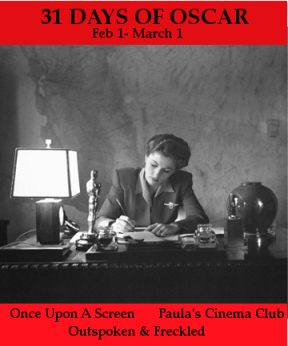 This post is part of the 31 Days of Oscar Blogathon hosted by Once Upon a Screen, Outspoken & Freckled and Paula’s Cinema Club during the month of February. Be sure to read all the other fabulous contributions. I want Arlen’s bomber jacket too! And his boots! Those aviators really knew how to put together an outfit. I wish I could’ve seen this movie in person in 1927. I can’t imagine how mind-blowing this high-priced blockbuster would have been. Wow. What great thoughts you have here on a film that many downplay these days. I think I will watch Wings tonight just because of you and this post. Long live the Academy Awards, and long live Wings! Yes, long live “Wings”. A lot of people talk about how long it is, but it never feels like a long movie to me. I found the Blu-ray on sale for $10(! ), if you can believe it, and immediately snapped it up. It’s gorgeous on Blu-ray. Really enjoyed reading your review. I love this movie – one of Wellman’s greatest and worth watching and re-watching. A shame he didn’t get the Oscar for best director, but the film itself certainly deserved its award. The brief scene with Gary Cooper is said to have made him a star, and he makes a very strong impression in just a couple of minutes. This reminds me that the film has just been released on Blu-ray in the UK by Masters of Cinema, so I must get a copy of it soon and watch it again! Yes, you must run (not walk) to your nearest movie provider and get the Blu-ray. It is stunning. Re: Wellman – I KNOW!! Re: Gary Cooper – I agree. You can see his “star” quality in those few minutes he’s on screen. Okay, I am going to make an admission here. I gave up on this film after 20 minutes. As you probably know, Gary Cooper is one of my great loves, so a few years ago, I was scouring my public library’s inventory of Cooper films. “Wings” was among them, so I put it on hold without knowing a thing about it. A few days later, it came in, I picked it up, and popped it into my player. Imagine my shock to discover it was a silent film! (I didn’t even notice the film year, or I would have known that.) Anyhow, much as I love the classics (and Coop! ), I couldn’t get in to a silent, so I turned the film off long before I ever caught a sight of the beautiful Coop. Alas, since then, I have actually made it through (and enjoyed!) an entire silent (Phantom of the Opera), Thus, I am thinking that I would see “Wings” in a new light now. And your fantastic review of it confirms that I want to. The silent version of Phantom of the Opera is one I haven’t seen, but is on my list. I’ve seen bits and the style looks really interesting. A great, great film that gets to me every time I watch it. Timeless. It is timeless, isn’t it? I just read one of these Oscar lists that everyone publishes this time of year, and out of all 85 winners of Best Picture, “Wings” was listed 83rd! 83rd!! Third last! Needless to say, I’m drafting a response. Great post. I love this movie – it really has it all. And who can deny the allure of those romantic flyboys? Sigh…..
Ha ha! Allure, indeed! Plus, great aviator jackets and boots. Exciting good stories are timeless aren’t they! They sure are timeless – with or without sound. Thanks, Dor. It really is worth a watch – it has some very powerful imagery. But it is a longer movie…just so you’re prepared. However, it would be FABULOUS to see this on the big screen. 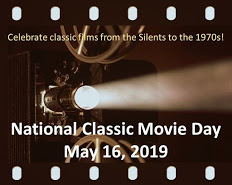 I have never seen a silent movie. It sounds like this one would be a good one to start with. I’m amazed that they could portray so much emotion without any words. I love Gary Cooper, too, so would like to see anything he is in. Thanks for opening my eyes to something new, Ruth. Gary Cooper isn’t in this movie for very long but, even with his brief appearance, you can tell he’s destined to be famous. The movie starts a bit slow, but soon you’re sucked into it and you forget you’re watching a silent film. I saw this on Blu-ray, and it’s gorgeous!